A1 Sparkles Cleaning is your local Philadelphia Suburbs rug cleaning company for all types of rugs! 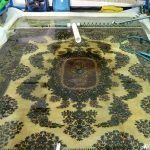 Whether an old family heirloom or new designer rug, we clean them all with exceptional care. Pick up, delivery and light furniture moving included. Save 20% and bring em on into our Rug Spa. If you’re in a hurry, ask for our Express curbside assistance. A1 Sparkles Exclusive 12-Step Rug Washing Only $2.69 per square foot. Rug cleaning performed on a 4-degree slanted floor! Now gravity helps us pull the dirt down and out! 1. Inspection – Every rug, is thoroughly inspected. 2. Dusting – Rugs lay flat, facing down, on 1/2 inch steel grated flooring. The Wolverine rug dusters leather bands beat and vibrate the dirt out. 3. Vacuum – Using 2- 3 different vacuum machines we ensure rugs are dust free as possible. 4. Washing – Depending on the type of carpet we use horizontal or verticle agitation equipment in one or more of the following methods. Counter-rotating scrubbers to pull (vertical) and or counterrotating 175rpm bonnets and brushes (horizontal)with just enough power to deep clean without compromising the rug’s pile or structure. With emersion, cleaning rugs get submerged in 3-5 inches of water. Low moisture requires no more than half of the rugs displacement be water. Dry rug cleaning could be a dry absorbent compound or an approved dry cleaning solution. 5. Rinsing – With emersion and shampooing in the basin purified fresh water enters in one end, while the dirty water gets pumped out the opposite end. For Shampoo and Low Moisture methods truck-mount vacuums and 400-800 psi steam rinsing. A second rinse occurs as the rug is hanging. Either purified water is poured on the top of the area rug on down, or truck-mount hand tools spray and extract difficult regions. 6. Specialty Services – Deodorizing, moth treatment, fringe whiting. For pet odor removal, we add enzymes and soak the rug overnight. Rollers, pile lifters, and scrubbers are used to agitate and flex the fibers. 7. Drying – We drop the indoor humidity to desert levels and move warm, clean air through the rugs. A HEPA 500 Dri Eaz Air Scrubber cleans the air. 8. Detailing – Rug brushing and transparent hand tool extraction. 9. Grooming – Brushing the sides, fringe, and hem. 10. Pile Lifting– The most profound vacuum on the planet.! Adds life to your rugs by removing fine dust your Bissel cannot even begin to reach. 11. Inspection – Clean rugs do not leave our facility until they have a fresh fluffy feel and look years younger. 12. Delivery – Clean rugs are wrapped in brown art paper and supporting plastic wrap. For customer pickups, we will load your them into your car. Rug delivery includes light furniture moving and relaying you clean rugs. Rug Cleaning Sale! Save 20% You drop off and pick up your clean rugs! Basic furniture moving & tabbing. Prepare and establish protected areas. Post cleaning wrap-up, & free rug spotter. Not Available For Fringe Cleaning, Stains, Odors, or Heirlooms, Sisal, Silk, or Antiques. 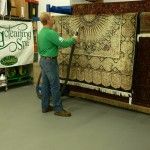 Inspection – Before cleaning every very rug is thoroughly inspected. Vacuuming – We will vacuum your rug using multiple passes to extract as much dry soil a possible. Washing – Rugs are preconditioned using a Green Seal Certified Pre-Treatment, hand scrubbed, and our robust 25 hp vacuum extracts deep down dirt. Rinsing – Injecting purified water directly into the rug’s pile while simultaneously extracting any remaining soil. Drying – Using our specially designed green glided wand glide we will perform multiple dry passes to extract as much water as possible. We then clean around the edges while drying the floor. In conclusion, we offer two types of rug cleaning methods to fit your budget. 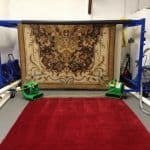 Best rug cleaning at the best price. 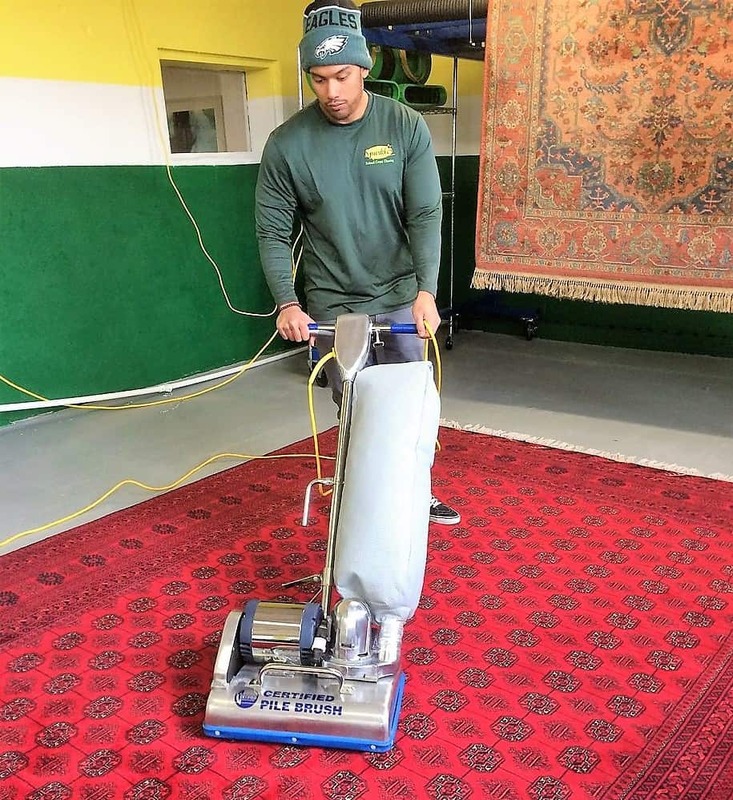 If you are interested in our rug cleaning services in the Philadelphia suburbs, then please call 610-292-9069 or complete our online request form.